I tried to be really careful about posting where Parker was or what he was doing on deployment. OPSEC and blogging aren't necessarily besties, and I wanted to make sure I wasn't divulging any information that could be considered confidential. 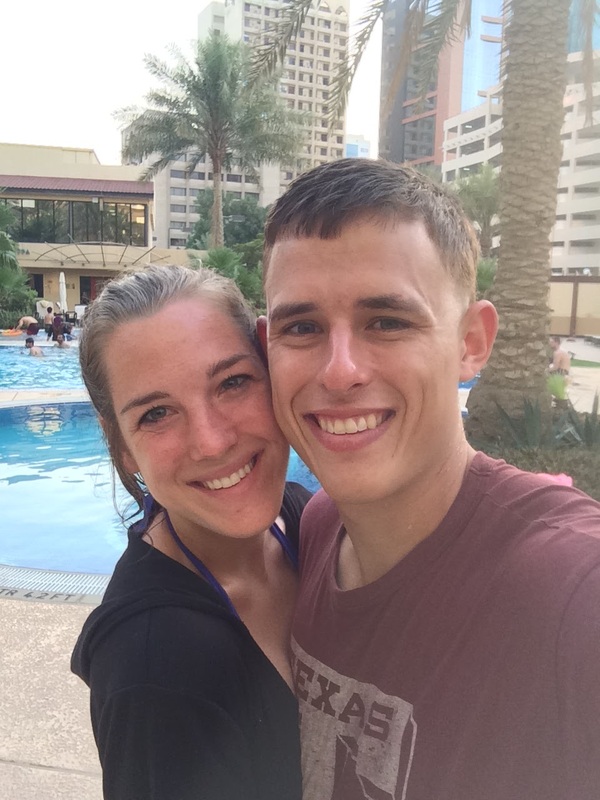 Now that deployment is over, I can share some of the details I was holding back. I actually flew halfway around the world in late July to spend a week with Parker, and I want to share that experience before the details become hazy! 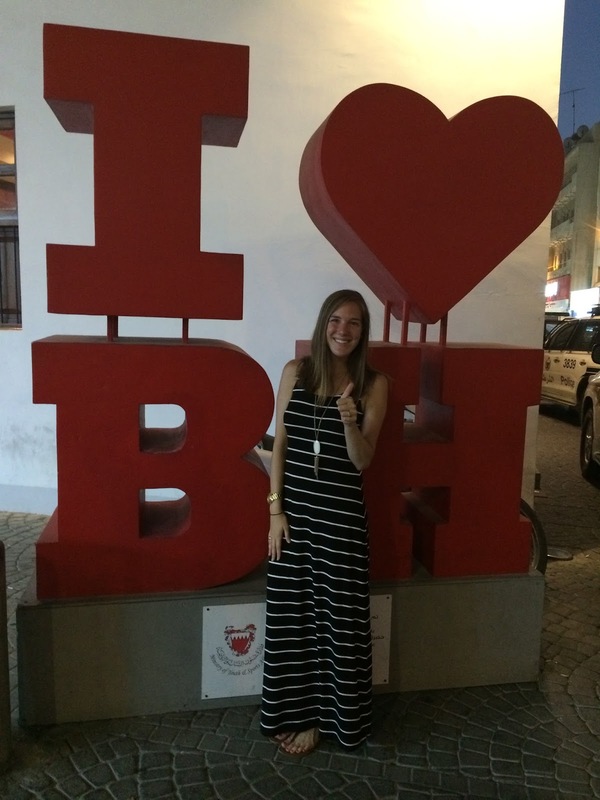 By halfway around the world, I mean Bahrain. Never heard of Bahrain? I hadn't either! If you look on a map, it is right next to Saudi Arabia. 1. It's hot. Really hot. The temps were usually about 110 degrees with a heat index of 140. I've never experienced heat like that in my life! It didn't help that I came in the heat of the summer. Their winters are usually in the 80s. 2. The primary religion is Islam. You will see some people dressed head to toe in long robes/tunics and others dressed like us. 3. If you are female, you will get stared at. Despite the scorching temps, I kept my legs covered the entire time with maxi dresses or jeans. I might as well have been in shorts, because if you are an American woman, you are going to get some stares. 4. The local currency is the Bahrain Dinar, or BD. The conversion rate is 1 BD = $2.65. So, things are a little more expensive over there. I was 10 weeks pregnant when I made the trip, so while I wasn't feeling too hot, I happily sucked it up for the chance to see my husband. The flight was long and pretty brutal being sick, but the minute I saw Parker, it was all worth it! My trip over there was a great mix of relaxation and exploration. We explored the Souq, which is a huge market in an old part of the city where people try to peddle their wears. If you want to buy a suit or jewelry, it's a great place to go. Fun fact: Google Maps does not know how to navigate the Souq. I got us quite lost that night. Thanks to all the rest I got during the day, I was ready to go for our afternoon and evening activities. Almost every day, our afternoon consisted of laying by the pool. What better way to beat the Bahrain heat? This was a highlight for us every day... we loved our time by the pool! One of my favorite evenings was visiting Shawarma Alley. 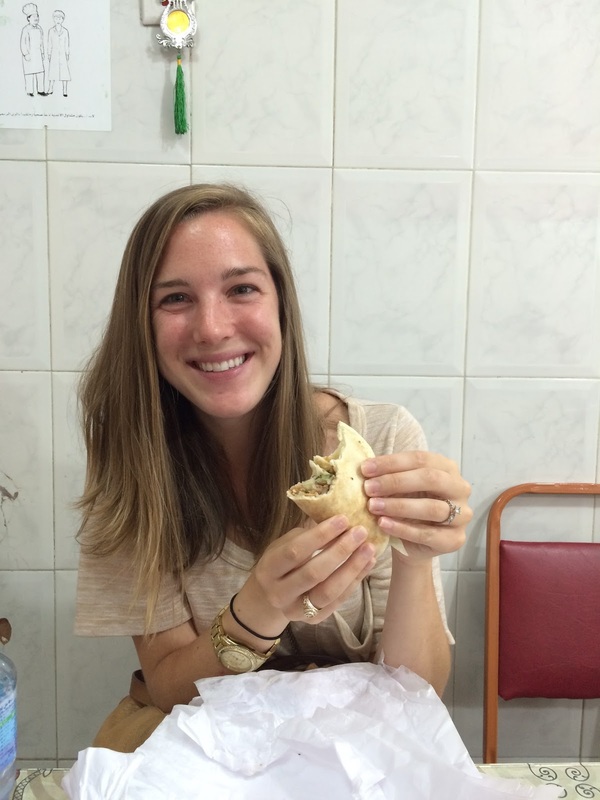 Shawarma is kind of like a middle eastern gyro. 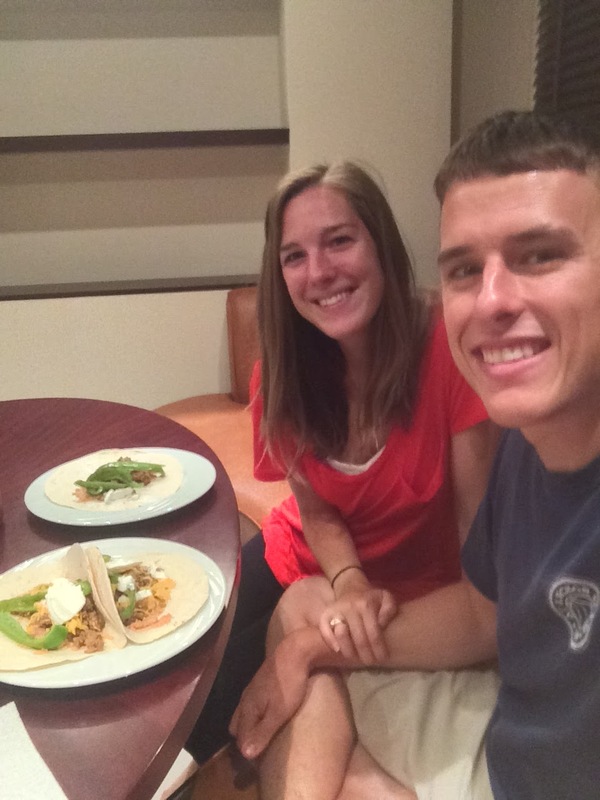 They have meat, some sort of lettuce or cabbage, and a white sauce that is almost a little sour all inside a pita. I probably prefer the traditional gyro, but the Shawarma was good and such a cool experience! It was one of the cheapest meals we had, though you do have to pay for water over there. There was also a sink randomly in the dining room. While walking down Shawarma Alley, we found a movie store that was selling movies for 1 BD (Bahrain Dinar, the local currency). They are most definitely illegally made, but we purchased Me Before You, which was still in some theaters back in America at the time. We watched it back at the hotel and really liked it! 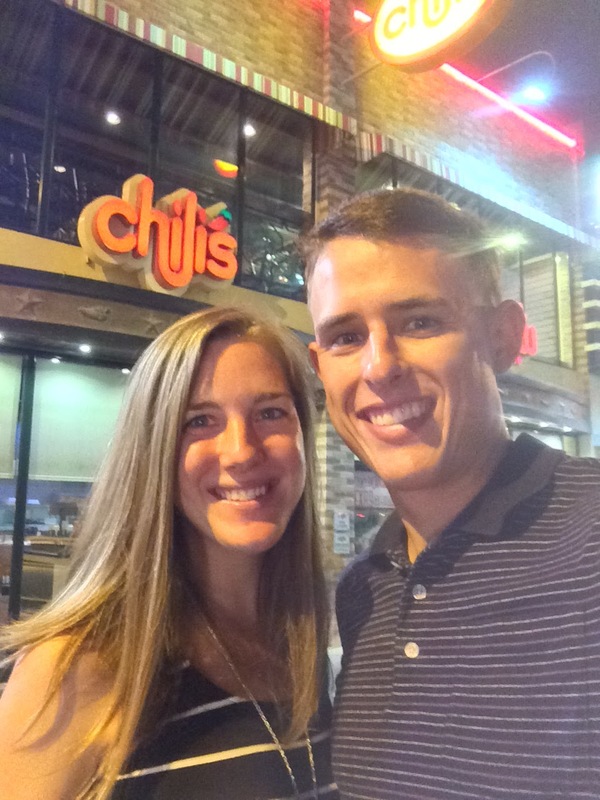 Another favorite night was date night... aka Chilis and a movie! We saw Bourne on base and loved it! 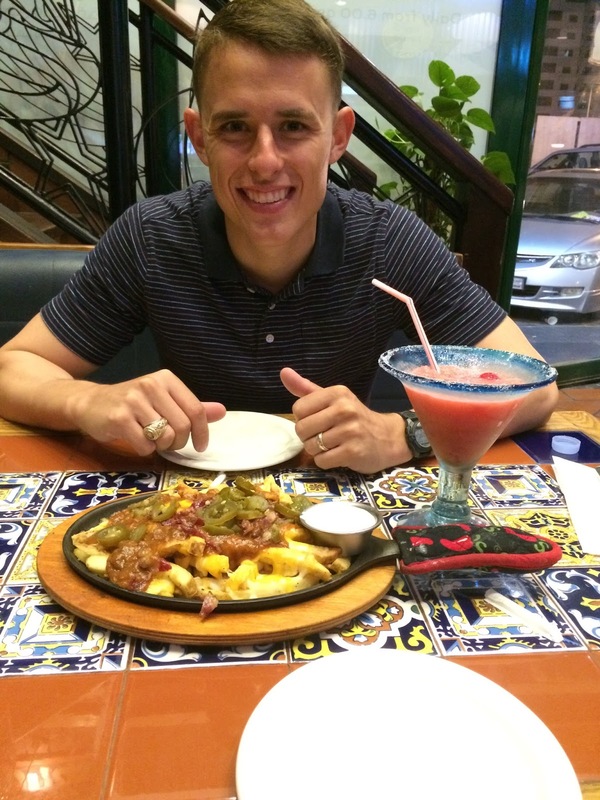 Chilis is one of our favorite restaurants, but it doesn't taste quite the same in Bahrain. We didn't love it as much. Actually, I had trouble eating it while still in the first trimester and actually haven't wanted it since. Still a great night though! Chilis and a movie made us feel like we were back home together. On the nights we ate in, we hit the pool after. It was such a relaxing place to talk and just hang out, and we were usually the only ones there. It felt like our own little private resort! 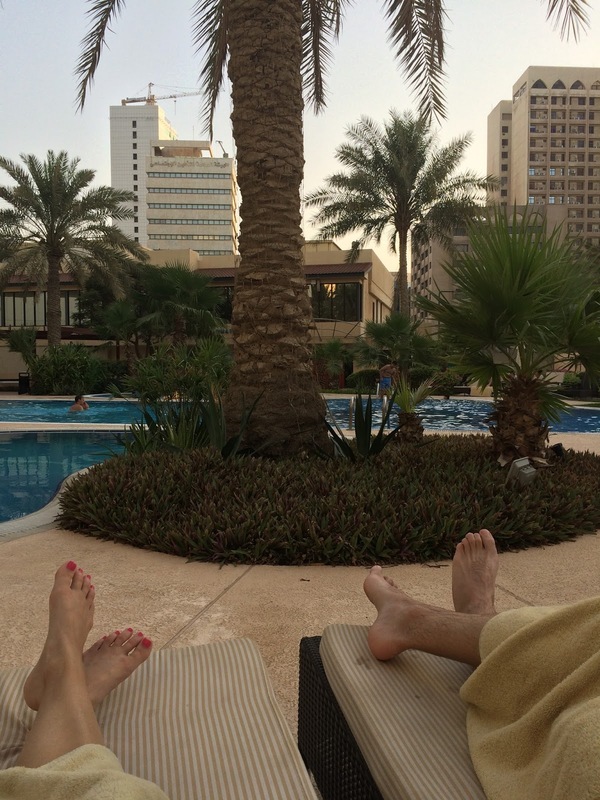 My six days in Bahrain came and went all too quickly, but we are both so thankful we got the opportunity to spend that time together. 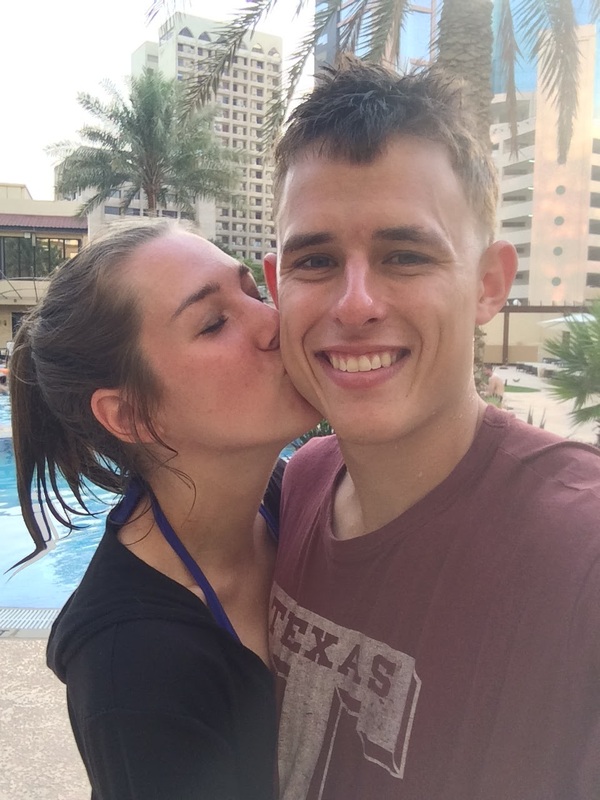 It helped break up the deployment and make it more bearable, and we got to create memories in the hotel where Parker stayed the majority of the deployment. He said knowing I had been there ended up being his favorite part of Bahrain and made him enjoy where he lived. We had planned for me to come out there again in October, but we both decided I was a little too pregnant for the trip and it was best for me to stay back. Since we cancelled the October trip, I am soooo grateful we took the opportunity in July to see each other. That time together was so special! Oh my goodness HOW special!! I loved reading all about this- what an amazing experience!! :) SO glad that your hubby is back home safe and sound with you!! Praying for you both and these exciting days till Baby comes!! 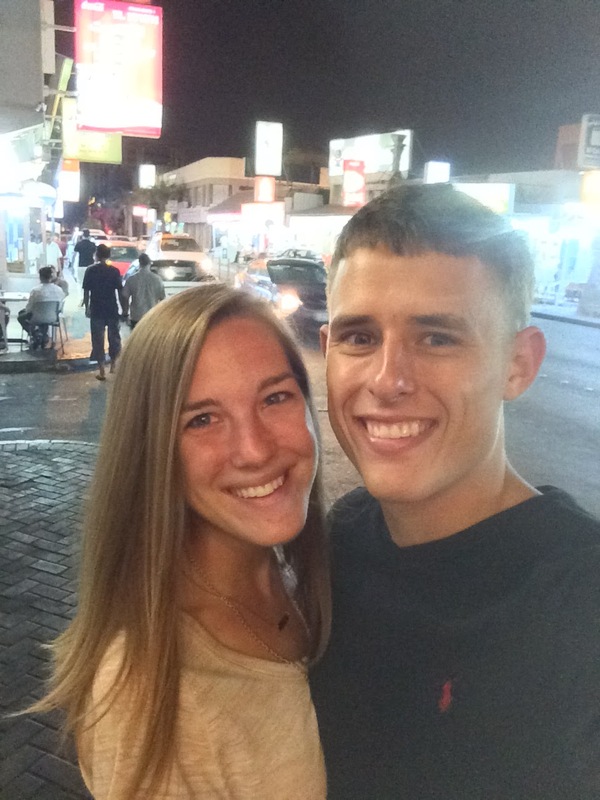 How wonderful that you were able to sneak away to visit your man! I'm so glad Parker is home safely! I'm not a military wife but I am an Aggie so we have something in common. 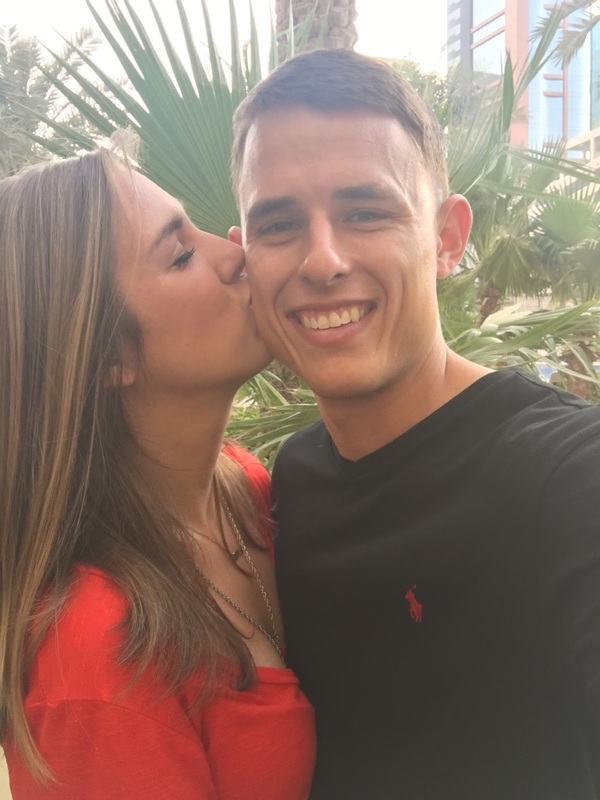 I've enjoyed following your journey through deployment and this was a fun little surprise post! Wow, they have really built it up over the last 25 years. Bahrain is so modern. I remember going there on the Gulf War cruise in 1991, there wasn't much there. In 1993, on my second cruise, there was a little more. Now, it is all built up. It looks so modern and wonderful. Glad that you had a great time. That is so awesome that you got to go visit him :) And how many people can say they've been to Bahrain? That is so awesome that you got to go visit him in Bahrain! My best friend Tory actually lived in Qatar for 10 years (her mom works for Exxon Mobile) and the culture is SOOO different! Tory had picked up a Qatari accent and I had trouble understanding her for a long time when we first met! Haha, the movies line made me laugh! When Andy was in Afghanistan they all had hard drives full of illegally downloaded movies and they'd pass it around. He said that half the time it was just crappy cell phone footage recorded in the theater but they happily watched it anyway! Did you fly Space-A or civilian? That's so neat that you could visit him while he was deployed! I wish we could! What a lovely trip! I'm so glad you got to go visit him. That is so cool that you got to go visit him! I've actually seen that with some other military spouses and think it's so sweet. You guys made some amazing memories. That's awesome you were able to go visit. What a unique opportunity!